Italy is a Mediterranean country located in southern Europe. It is bordered by the Adriatic Sea on the east coast, the Tyrrhenian Sea on the west or Mediterranean coast, and the Ionian Sea to the south. In the north, Italy is bordered by the countries of France, Switzerland, Austria, and Slovenia. The Italian mainland is a long peninsula that resembles a tall boot, so much so that the country is often referred to as "the boot," with the Puglia region in the southeast being the "heel of the boot" and the Calabria region in the southwest being the "toe of the boot." Italy is known for its Mediterranean climate, which is found mainly on the coast. Inland it is generally cooler and wetter but usually hotter during the summer. Southern Italy has a hot and mostly dry climate while the north has more of an Alpine climate, getting lots of snow in winter. The area of Italy is 116,305 square miles (301,230 square kilometers), including the islands of Sardinia and Sicily, making it just slightly larger than the state of Arizona in the United States. The tiny sovereign nations of Vatican City and San Marino are enclaves within Italy. Italy is divided into 20 different regions, including the islands of Sicily and Sardinia in the Mediterranean Sea which are each a separate region. Each region has its own unique culture, customs, and cuisine so you'll find a lot of differences between regions in the north and those in the south. The central Italy region of Tuscany is probably the most well-known and most visited by tourists. 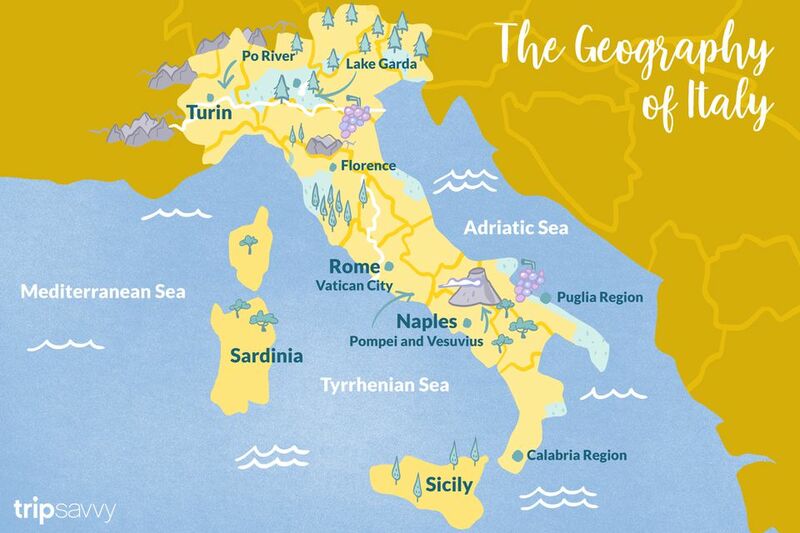 See this map of Italy's regions for their locations and more information about them. Italy's population is a little over 60,000,000 people. Although the Italian birth rate is low, the population is increasing due to immigrants entering the country. The population density is about 200 people per square kilometer. While Italian is spoken throughout the country, many regional dialects are still spoken. The largest Italian city is Rome, with a population of nearly 3 million people. Rome is also the capital and heads the list of top Italian cities to visit. About 40% of Italy's land is mountainous, offering great places to ski in winter and hike in summer. There are two major mountain ranges, the Alps and the Appennino or Apennines. The Alps, in the north, are divided into regions called, from west to east, the Occidentali , the Centrali, and the Orientali and are on the borders with France, Austria, and Switzerland. The backbone of Italy is formed by the north-south trending Appennino chain. 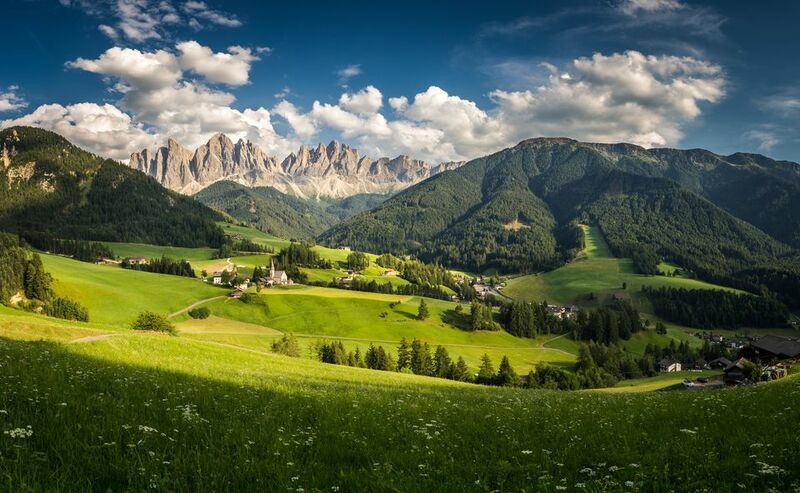 The Dolomites are really part of the Alps, located in the South Tyrol, Trentino, and Belluno. The highest point in Italy is Monte Bianco (Mont Blanc) at 15,770 feet, in the Alps on the French border. Mount Vesuvius, in southern Italy near Naples, is the only active volcano on the European mainland. It was Vesuvius that buried the famous Roman city of Pompeii, whose ruins are a popular tourist site. On the island of Sicily, Mount Etna, also still active, is one of the world's largest volcanoes. The rivers in Italy correspond to some of the major tourist destinations. The Po River starts in the Alps in the north and flows eastward from the city of Turin to the east coast and the Adriatic Sea, going through the very fertile Po Valley. At the river's end, the Po Delta is an interesting place to visit. The Arno River flows from the north-central Apennines through the cities of Pisa and Florence (where it's crossed by the famous Ponte Vecchio) and empties into the Tyrrhenian Sea on the west coast. The Tiber River flows from the Apennines and goes south through the city of Rome, also emptying into the Tyrrhenian Sea. Italy has many lakes, especially in the northern part of the country. Lake Garda is the largest Italian lake, with a distance around the lake of 158 kilometers, or about 100 miles. See top lakes to visit in Italy.